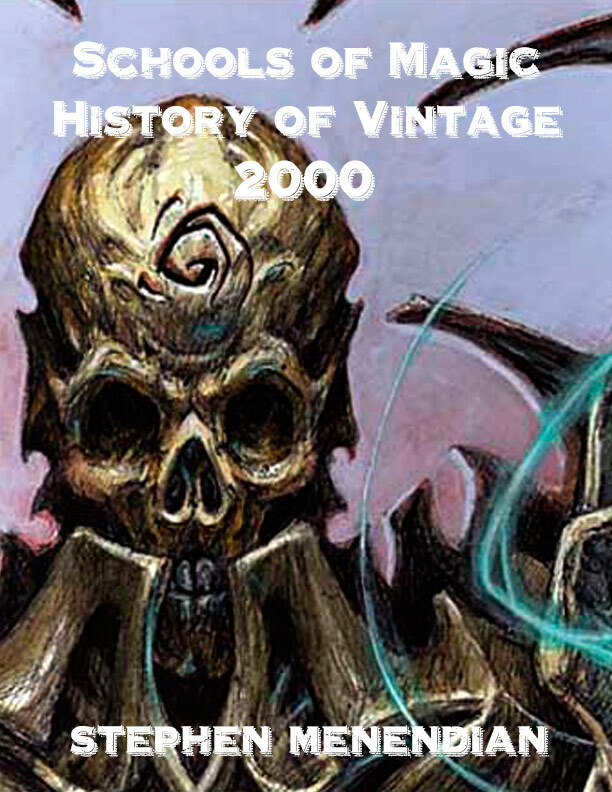 Continuing the epic Schools of Magic: History of Vintage series, Chapter 8 (2000) is a tale of two Invitationals. The old ‘Schools of Magic’ were being revived or reconstituted just as a long-standing pillar of the format was about to fall. The Type I metagame for each Invitational that buttressed the year is a revealing snapshot of what a difference the restrictions in 2000 made, as players brought into being a new Type I order. 2000 was also the year that the Type I community began to organize itself into online forums, rather than just Usenet and email lists. Learn about the emergent and passionate community of Type I players and advocates, how they influenced the format, and what they meant to the history of the game. 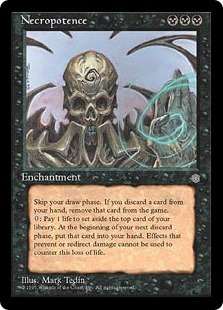 The entire game of Magic, from June 1995 to October 2000, is in one way or another defined by the card Necropotence. It shaped nearly every format it touched, which was virtually every format thanks to the reprinting of Necropotence in Fifth Edition, which anchored Extended for many years. More broadly, Necropotence defined Magic by bringing into a crystal clarity and laser-like focus the paradigm that emphasized the paramount importance of card advantage. Within that paradigm, there was no greater engine. As a siphon, Necropotence was unparalleled in its ability to translate an abundant resource into the most precious. It’s unheralded arrival in Ice Age, where it was not simply overlooked but actively disparaged, can be contrasted to a period in which Necropotence was increasingly regarded as among the most problematic cards in the game. One the questions posed over and over again is how or why Wizards and the DCI permitted Necropotence to exist for so long in so many formats. It has been called by some as one of the ten biggest mistakes in Magic history. Players either cannot honestly understand the DCI’s logic or seem driven to underscore their illogic by conveying ritual astonishment at this bald fact. It is not simply that Necropotence was allowed to exist, but the DCI’s pattern of bannings almost seemed to suggest a desire to find ways to preserve Necropotence amidst an increasingly untenable Extended format. The DCI banned Dark Ritual and Mana Vault in an attempt to slow down Trix, arguing that it was the mana acceleration that was the “real” culprit. Players like Michelle Bush began substituting cards like Mox Diamond and Lake of the Dead instead, forcing the DCI to finally ban Necropotence in Extended in March 2001. Given the obvious efficiency of Necropotence when everyone had great appreciation for card advantage, why would the DCI seek to keep Necropotence as a meaningful part of the game? The answer to that question is less clear, although one can speculate. Necropotence was so deeply embedded in Magic play and culture that the DCI may have justly believed – despite mounting evidence to the contrary – that it could be used fairly. After all, historical experience documented evidence of Necro decks that did not dominate metagames. Necro unveiled the principle that card advantage is not fungible. Drawing many extra cards, while verging on overwhelming, was not viewed as unfair if most of those cards were in themselves fair, like 2/1 Orders of the Ebon Hand or Juzam Djinns. The power of Necropotence no doubt explains why creatures like Juzam Djinn were still being played in the format long after they were clearly or outclassed in efficiency. It was not until emergent combos like Illusions of Grandeur and Donate were available that Necropotence looked more like a degenerate engine than a powerful but risky way to replenish the battlefield. As more of these combos emerged, Necropotence looked less and less innocuous. Demonic Consultation was one of the best and most efficient ways to find Necropotence. Yet, as the Magic Invitational’s finals Type I match illustrated, Consult could be used to simply summon other combo parts to hand. This undoubtedly informed the DCI’s decision. On the other hand, from our historic vantage point, the decision to restrict Consult on top of Necropotence may have been premature. Consult was primarily and almost exclusively abused in Necro decks. Restricting both Necro and Consult were two restrictions targeting the same problem where only one was arguably necessary. Moreover, the logic of the DCI’s “tutor” analogy is strained when we observe the range of tutors that were not restricted and the related fact that Necropotence was Consult’s favorite target. This is not to say that Consult was undeserving of restriction or would not have eventually merited restriction, but that the double restriction of both Necro and Consult may have swept more broadly than necessary. The restriction of Necropotence fulfilled Steven Merritt’s warnings in the Fall of 1999 about the likely effect of the anti-combo restrictions enabling Necro above all. What was not foreseen and was in fact unforeseeable was the way in which Necro would fuel arguably the best combo deck yet. The three most popular decks in the 1999 Invitational were The Deck/Keeper, Restricted List/Academy Combo, and Necro decks. With the mass of restrictions in late 1999 designed to neuter the Academy combo deck, and the restriction of Necro and Consult to neuter Necro based strategies, would blue control decks, the last man standing, dominate? Or, would other strategies, new or old, rise to the occasion to compete with blue based control decks? We would soon find out.